Hidcote Manor, near Chipping Campden in Gloucestershire was purchased, as a farm, in 1907 by Gertrude Winthrop, a widow. After serving in the First World War her son Major Lawrence Johnston took over the house and devoted his time to creating the great garden at Hidcote. When he first acquired the property, there was no garden at all, just a few fine trees. 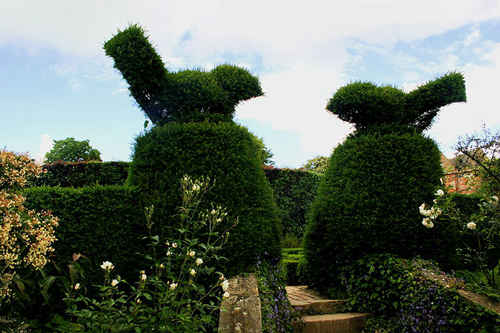 Hidcote is well known for its series of “outdoor rooms”, each with a different character and separated by walls and hedges of many different species, the garden is famous for its rare shrubs and trees, outstanding herbaceous borders and unusual plant species from all over the world. < His ideas were entirely original, though possibly influenced by French garden layout and English garden style. He had been born in Paris of an English mother and American father. He personally collected many plants from Africa and China on a plant expedition in 1927. His many gardening friends also sent plants to Hidcote from all over the world. I was asked to examine some fragments of paint that had been removed from the Plant Shelter and other structures in the Garden. It had been noticed that a green colour was visible under the “Hidcote Blue” currently employed. I was able to confirm that this was yet another example of the phenomenon seen when a Brunswick green paint ages – the green becomes blue. I have called this the “Penrice Effect” after the house – Penrice Castle where I first encountered it. Fascinating article, I have long admired these blues at Hidcote. I wonder how would one achieve this colour instantly, without needing to wait for nature to change the Brunswick green? Is there a paint colour that replicates the Penrice Effect? Thank you. “Yes” and “No” is the answer. We have measured and matched individual examples with mixed results. Here’s a photo taken of me doing just that a week ago – In truth nothing will ever replicate the uneven, dusty effect of ancient lead paint. For this latest job we have presented the client with two choices a) the actual average of his door in Westminster & b) a match to the Penrice Castle doors. Once explained clients usually understand that it is an effect / a fleeting glimpse rather than a single colour. If you ask at the shop for “Penrice Blue” we should be able to dig it out for you. I left a reply comment when you initially answered my comment but I see that pesky blogger must have failed me. Thank you again, belatedly for your response, after a trip to Hidcote today and close inspection of the paint I am still hankering after trying to replicate it, I’m popping into the shop this week for some colour matching advice and samples, will definitely also pick up a Penrice Blue sample pot to try out -excited to see if I can create a bit of the Hidcote magic at home!